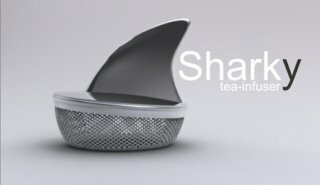 If you are an avid shark enthusiast, watching Jaws every movie night and never missing a shark special on TV, yet you also enjoy the refined tradition of a hot cup of steeped tea then the Sharky Tea Infuser is made for you. This tea accessory, by Argentinean designer Pablo Matteoda, is an unexpected combination of elegance and gory fun. Sharky has a menacing-looking dorsal fin that floats above the water and a tea infuser basket attached to the underside. 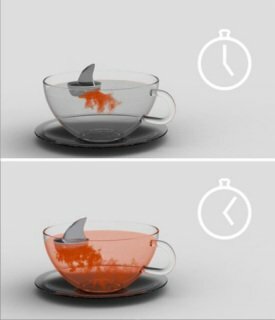 As Sharky swims about your tea cup and the tea steeps it lets off cloudy bursts of flavor that can look rather ominous if you are a devotee of red-hued teas such as rooibos or some fruity infusions. A clear tea cup would be a must to get the full effect from this unique gadget. Unfortunately, this conversation starter appears to be only a concept for the time being. It looks to have a lot of admirers though, so hopefully it will be available in the not so distant future. See Ya Later, Lawn Gator!